helping small- and medium-sized centres grow by its smart and efficient marketing and management modules. Potential customers are accurately targeted by our marketing system and hereby converted to enrolled students. The management system helps to keep the existing ones by real-time tracking and monitoring. The accumulated data, most important of all, assist in making future decisions so as to keep the centre grow in a sustainable manner. The marketing and growth module in Skoolight helps you recruit new students with easily-created online campaigns that target the right audience. Meanwhile, the leads tracking system assists you to grab every opportunity towards growth. Skoolight enables its users to create customisable online campaigns easily. The campaigns, once created, will be disseminated via multiple channels that are proven to be effective by our experts. We help optimise your audience group with our data technology, thus make sure that your ads are delivered to those who are your target audiences. Skoolight provides you with easy access to the information of your leads, including their status. It helps you do timely follow-ups, therefore secure every growth opportunity that you have encountered. Skoolight provides centre owners with a comprehensive management system that not only helps to put everything in the right place but also informs the operators of the right business decisions to make. When to open another class? How are the students progressing? All answers can be found here within clicks. To ensure that you are managing a competitive personnel, Skoolight's management module supplies a solid data track function that allows administrative staff to assess how the teachers are performing. Trial class conversion rates, attendance and students' performances — all can be found here. Generating invoices is laborious work, while Skoolight simplifies it to the extent that you no longer have to worry about it. 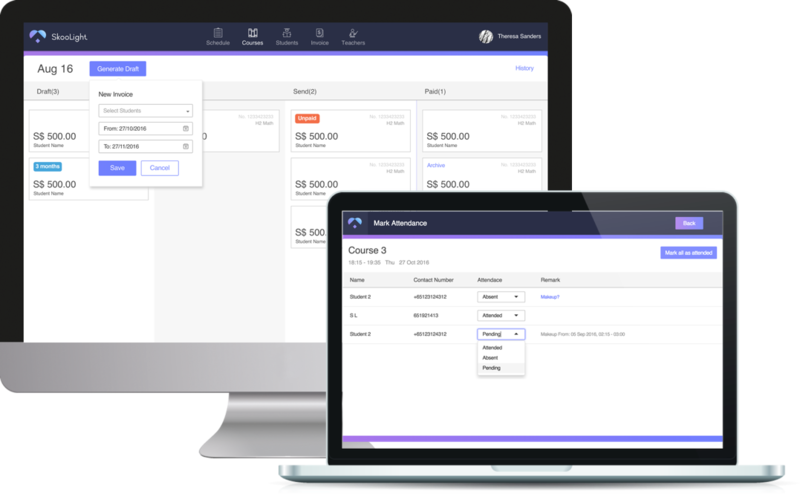 By dragging and dropping invoices that created largely automatically, you obtain your revenue and prevent any possible losses at anytime, anywhere, under any circumstances. Skoolight's calendar is the best overview a centre would have if he or she would like to know how the centre is operating. You will be able to grasp a basic idea of who's teaching which class, and who will be attending, in just a few seconds. Adding trial students, notifying teachers accordingly — these tasks are less troublesome and it saves your time greatly!